Overview - The Sunset Limited is a searing, two character drama that mixes humor and pathos while examining the relationship between two strangers who are brought together by desperate circumstances. The story focuses on two very different men – a deeply religious black ex-con (Samuel L. Jackson) who thwarts the suicide attempt of an asocial white college professor (Tommy Lee Jones), who tried to throw himself in front of an oncoming subway train, the Sunset Limited. As the one attempts to connect on a rational, spiritual and emotional level, the other remains steadfast in his hard-earned despair. As their philosophical debate progresses, each spar passionately to defend their personal credo and convert the other. Words can be powerful tools. Devastating tools. In the right hands, the right words can stir nations, can inspire optimism, can spread hate, or topple empires. In the right hands, the right words can destroy or heal. In the case of 'The Sunset Limited' one soul tries valiantly to find the right words -- the right, specific combination of words that would enable him to save his fellow man. Nothing more than a single conversation between two ideologically opposed individuals, the film somehow manages to remain wholly compelling, weaving a verbal war between hope and despair. A murky, powerful rumination on life's fundamental debate, the movie's philosophical conflict will linger with you long after its images have faded from the screen. Based on the play written by acclaimed author Cormac McCarthy, the plot revolves around a single discussion between two disparate men, a working class ex-con, known only as Black (Samuel L. Jackson), and a depressed professor, referred to in the credits as White (Tommy Lee Jones). Tired of life's endless futility, White attempts to kill himself by jumping in front of an oncoming train. Though complete strangers, Black stops the suicidal man at the last minute. After taking the professor back to his small apartment, the religious ex-con desperately attempts to convince White that life is still worth living. What follows is an intricate ballet of words, with each man attempting to plead their case. Black advocates the existence of God, love and hope, while White systematically refutes his claims with tales of humanity's horror and emptiness. Their constant back and forth leads to an all encompassing philosophical argument that ultimately holds the key to the professor's fate. McCarthy's dialogue is endlessly dense and complex, blending an authentic colloquial style with a kind of flowing lyricism. Certain monologues and exchanges are almost impenetrable, offering a challenging experience that rewards repeat viewings. There is a poetic quality to the characters' words that feels grandiose and epic without sacrificing a certain stripped down realism. The conversation covers a wide range of topics and themes focusing on the existence of God, the merits and pitfalls of faith, the duality of human nature, and man's eternal search for meaning and purpose. Both sides are given equal emphasis with each character gradually building their stance through several dramatic reversals and momentum shifts. Insightful and profound, the conversation swells with revelations, both optimistic and bleak, illuminating one of life's core conflicts. Jackson and Jones are incredible as the vocally sparring pair. While there are instances where both characters could potentially come across as nothing more than ideological mouthpieces, the actors always manage to instill a level of humanity and personality into their roles. Jackson gives Black a likeable, everyman quality. Though the character lacks the academic education of his counterpart, the ex-con is full of hard earned wisdom which the actor playfully hides behind a deceptively simple exterior. Jackson explodes with impassioned sermons throughout that all feel raw and honest, preaching hope through personal stories and life experiences. On the other end of the spectrum is Jones (who also handles directing duties). As the hopeless professor, he becomes the physical embodiment of despair. If Jackson sees the world as black and white, then the professor just sees it as black. Pitch black. A prophet of doom and gloom, it's as if there's nothing left behind his eyes, and the actor brings a dark intensity to the role that is utterly devastating. When the character finally reveals the full extent of his desolation, we suddenly realize that all the arguing beforehand was just harmless foreplay and as White opens the floodgates, Jones relishes every stinging syllable with vitriolic glee. Blocking and camera movement become an essential component of the proceedings, bolstering the subtext of the story through key visual choices. The manner in which the characters situate themselves and move about the space reflects the internal dynamics between them. As the tables are turned figuratively, various blocking choices, cuts, pans, and tracks will literally shift the balance of the scene. Simple transitions from one side of the room to the other, or from a table to a sofa, become indispensable to the action. The specific framing and physical distance between the men reinforces their emotional gulf, highlighting instances where they veer closer toward or further away from a mutual understanding. Small physical actions and background details take on great importance, enhancing the content. Both subtle and overt (one shot sees Jones lying across a couch while Jackson listens, mimicking a therapy session), the director's visual style helps to keep things interesting, giving cinematic weight to a potentially dull scenario. Fascinating and thought provoking, 'The Sunset Limited' features words that cut deep, that burn, that burrow into the mind and soul. Though there are bursts of hope peppered throughout, many elements of the work remain downright apocalyptic (in their own way, perhaps even more so than 'The Road'). In the end, as the competing merits of light and darkness are espoused, one side ultimately reigns victorious. One side ultimately finds the right words. Or do they? The final image could be interpreted in a variety of ways, leaving it up to the viewer to choose which side they fall upon. The dialogue heavy presentation certainly won't be for everyone, but those that enjoy other McCarthy adaptations or heady, philosophical debates in general, will definitely want to check this out. 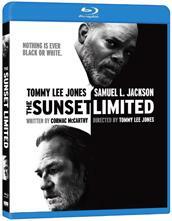 'The Sunset Limited' is brought to Blu-ray by HBO on a single BD-25 disc housed in a keepcase. Some skippable trailers play upon startup before transitioning to a standard menu. The packaging indicates that the release is region A compatible. The movie is provided with a 1080p/AVC MPEG-4 transfer in the 1.78:1 aspect ratio. Shot digitally in high definition, this is a very strong transfer that manages to capture some impressive visuals out of a relatively limited location. The digital source is essentially pristine with only some very light noise visible in the background of a few shots. Clarity is exceptional, highlighting lots of fine details and rough textures throughout the set and actors. Facial features are especially impressive, with all the tiny nuances of the actors' expressions evident in every frame. Each individual wrinkle and line on Jones' weathered face is easily visible, becoming a visual roadmap of pain and hate. The film's moody lighting design leads to a great sense of dimension with pleasing contrast that doesn't bloom. The color palette is washed in rundown yet still extremely rich reds, browns, and yellows with little hints of blue and gold. Black levels look a hair light in a few shots, but are mostly nice and deep without crushing. Though its single location does limit the amount of visual variety on display, the filmmakers' end up doing a lot with very little. Subtle production design and lighting choices help to keep things interesting and with no major artifacts to speak of, this is a really great transfer. The movie is presented with an English DTS-HD MA 5.1 track. Subtitle options include English SDH, French and Spanish. As one might expect, dialogue is the real focus here, but thankfully the filmmakers' don't just stop there, and instead the sound design features some very interesting and artistic choices that enhance the mood and atmosphere. Speech is full and crisp during whispers and aggressive tirades. The main title sequence provides an assault of ambient effects, filling the room with sirens, subway trains, crowds, rain, traffic and ticking clocks. While the actual film is relatively quiet, outside noises do creep into the track at various moments, and composer Marco Beltrami actually uses these sounds to build upon his score, creating music through everyday clatter. Directionality across the front soundstage is good, but outside of some early rain and thunder, rear activity is disappointingly sparse. Dynamic range is wide, giving ample breath to all of Jackson's emotional stories. Bass activity creeps in during some key music cues. Dialogue is prioritized well, with effects and score balanced appropriately. While surround activity is minimal, the artistry behind the track's subtle design is spot on, creating a moody, delicate atmosphere of gloom. Free of any technical hiccups, this is a very solid mix. Audio Commentary with Executive Producer/Director Tommy Lee Jones, Writer Cormac McCarthy and Samuel Jackson – While the participants do offer some worthwhile bits of insight, this is a disappointing track. The trio never seem to fully warm up to the conversation and there are several rather lengthy pauses where they simply watch the film. With that said, there are some interesting morsels shared about the production design, HD equipment, and the filmmakers' specific approach to the material. The conversation also veers into random tangents involving life in New York and Jackson's childhood, and while not exactly related to the movie, these portions are still worth hearing. McCarthy briefly answers a few questions about his writing process, but much like Jones and Jackson he just doesn’t speak very much. The participants are all interesting (even fascinating) individuals and this could have conceivably been a great track, but unfortunately, they just don't have much to say. The Making of the Sunset Limited (HD, 5 min) – Presented in 1080p with Dolby Digital 2.0 sound, this is a brief making of piece with some behind-the-scenes footage and on set interviews. McCarthy's exceptional writing is discussed and we get some quick looks at set construction and rehearsals with Jackson, Jones, and the writer. Though very short, this is worth a quick look. 'The Sunset Limited' is a powerful examination of our very existence, illuminating the eternal conflict between hope and despair. Through nothing more than a stripped down conversation between two men, the filmmakers manage to present a wholly compelling experience. While the heavy philosophical content might not be for everyone, McCarthy's dialogue is utterly devastating and Jones and Jackson are both at the top of their game. The video transfer is fantastic, making the most of a single, limited location. Though quiet, the audio track features some inventive sound design. The included commentary is disappointing, however, and the featurette is far too short to offer much value. Supplements might be lacking, but the film and technical presentation are very strong, making this an easy recommendation.